Whyte & Mackay Blended Scotch Whisky is a popular Whisky available from Tesco Groceries in 70cl to buy online. Visit Tesco Groceries for the best price for 70cl of Whyte & Mackay Blended Scotch Whisky or compare prices on our other Whisky products. A blended malt that is unified with six different grain whiskies and matured sherry butts before bottling. On the palate it's seductively calm with honeyed silky fruits and affluent tones that assert their influence in the background before giving way to a pleasing warm aftertaste which lingers lengthy in the mouth. This exceptional blend is a true reflection of its founders exacting standards. Where to buy Whyte & Mackay Blended Scotch Whisky ? Whyte & Mackay Blended Scotch Whisky Supermarkets & Stockists. 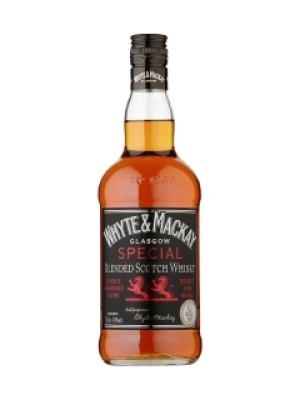 You can buy Whyte & Mackay Blended Scotch Whisky online in most retailers and find it in the Whisky aisle in supermarkets but we found the best deals online for Whyte & Mackay Blended Scotch Whisky in Tesco Groceries, DrinkSupermarket.com, and others. Compare the current price of Whyte & Mackay Blended Scotch Whisky in 70cl size in the table of offers below. Simply click on the button to order Whyte & Mackay Blended Scotch Whisky online now.